A scarlet macaw flies through the azure sky, greeting his jungle neighbors. A yellow giraffe and a blue elephant enjoy the verdant landscape. 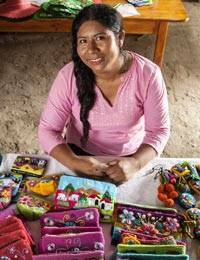 By Balvina Huaytalla, this handcrafted cosmetic bag showcases the traditional Andean art of arpillería. Each tiny figure is crafted in three dimensions and embroidered by hand. The reverse side is solid black cotton.